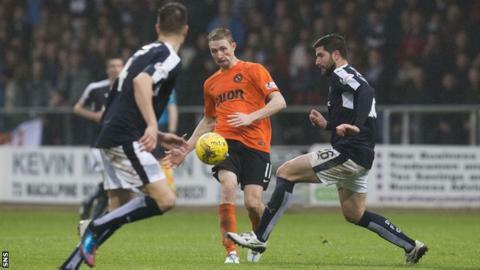 Dundee United midfielder Chris Erskine will return to Partick Thistle in the summer as the Glasgow club prepare for the departure of Stuart Bannigan. The 28-year-old Erskine has agreed a pre-contract to sign for Thistle on a three-year deal in June. Manager Alan Archibald expects to lose Bannigan in the summer. "We were aware of him being out of contract in at the end of the season and Dundee United hadn't made a move on it," he said of Erskine. "We have went through the right channels and have that in place and it's a good one to look forward to for next season." It will be Erskine's third spell with United's Scottish Premiership rivals. He started his career at Firhill before moving to Tannadice in 2013, only to be loaned back later that season. But he was a first-team regular with the Tangerines last season. This term, he missed out during September, October and November through injury but returned to action in December. Asked if Erskine could join Thistle during the January transfer window, Archibald told BBC Scotland: "That's down to Dundee United. "He's their player and we have to respect that and we've just put that in place for next season." Archibald laughed off newspaper headlines suggesting that he had threatened to resign should Bannigan be sold during January. "It was tongue in cheek what I said in the papers," he said. "But I would be devastated and we'll not let him go. "It would need to be crazy money to let him go. "It would not be worth it for us as he is a key player. "If you let your key player go in January for what would not be a great amount of money would send out all the wrong signals." However, asked about reported interest by Aberdeen, Archibald said: "It is just paper talk. There have been a few linked with him. "He's a good player and out of contract and we expect that. "We know he is going to go in the summer - he will get good offers. "But there is no bitterness. We won't get a fee for him, but we've had four or five years out of him playing at the top of his game."